Punches of colour enliven the family room, the area that gets the most use. 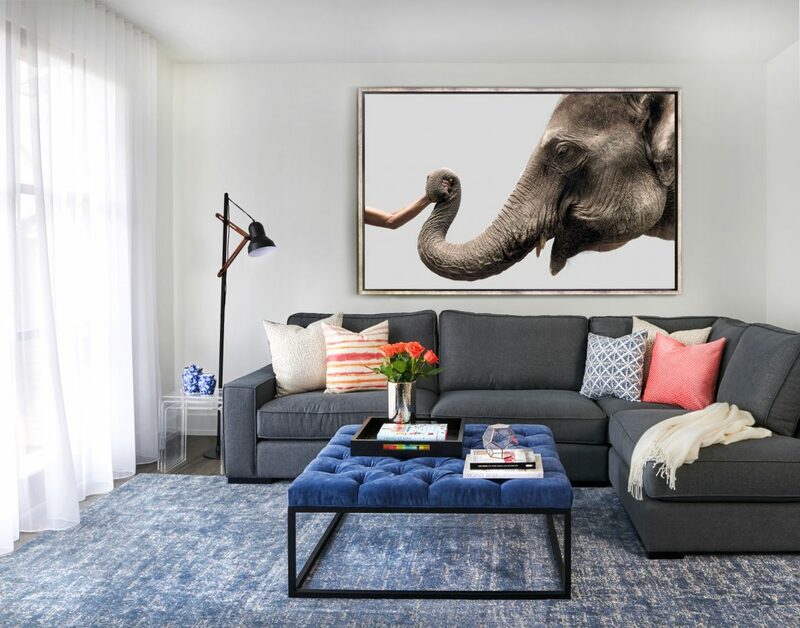 The vibrant blue of the contemporary tufted ottoman is picked up in the large area rug. Sectional: Marcantonio Designs; area rug: Distinctive Broadloom & Interiors; ottoman: Impressive Furniture Design; side chair: Structube. And baby made three — children under six years of age, that is. Which for the owners of this detached two-storey home triggered a stay-or-go dilemma. The family definitely needed more elbow room than 1,500 square feet afforded them. But after seven years, they had grown attached to both the 1930s-vintage home and the Humewood area of Toronto, with an elementary school and a park so nearby. A photo taken in Thailand by photographer Brent Lewin is a striking piece of artwork. Sectional: Marcantonio Designs; area rug: Distinctive Broadloom & Interiors; ottoman: Impressive Furniture Design. And so the family packed up and moved into a nearby rental home for 10 months. During that time, construction crews from Haddington Developments were hard at work, executing architect Drew Laszlo’s plans for an extension to the rear of the house. It adds another 556 square feet and an extra second-floor bedroom to the existing three, plus a home office. A playroom area was carved into the basement and a family room with patio doors for easy access to the deck and backyard was added to the main floor. 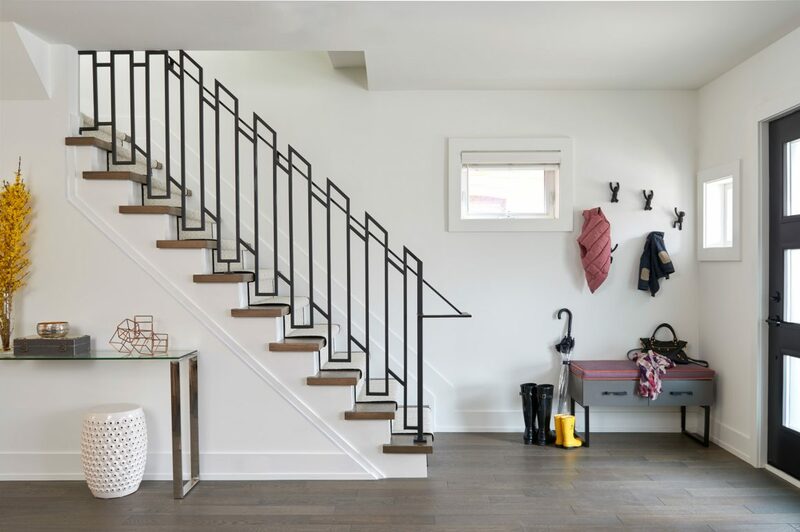 Eliminating a hallway closet opened the space and showcased the striking, locally crafted custom stair railing. Stair rail: Railing Excellence; custom bench with storage and all millwork: Chubin Fine Cabinetry. 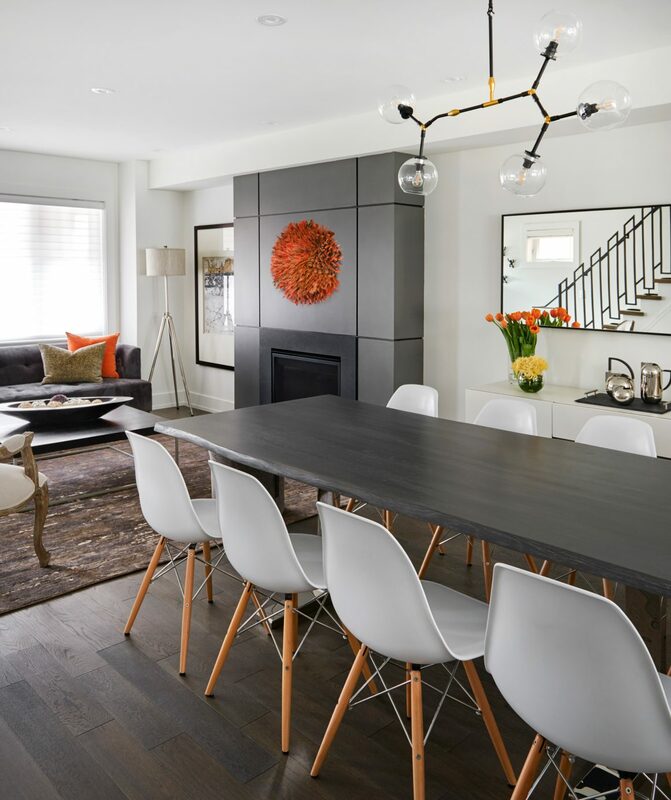 The right choice of sideboard and overhead light fixtures allowed the homeowners’ existing table and chairs to look right in the new space. 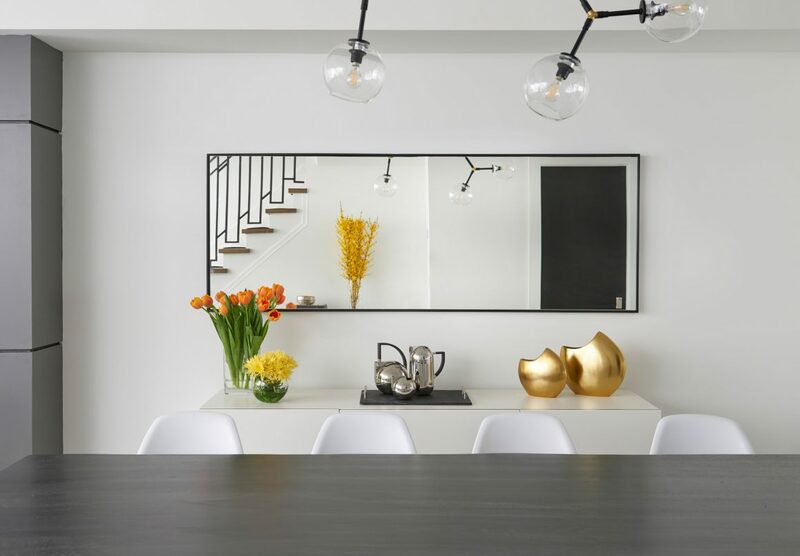 Sideboard, mirror: Structube; light fixture: Nuevo. 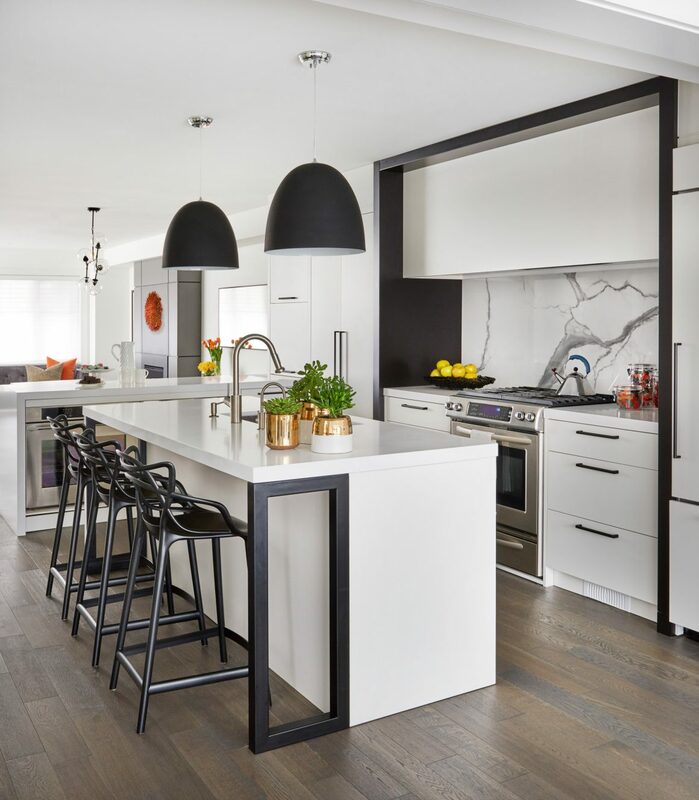 The kitchen design, for instance, began with many disparate elements that the owner had seen and liked, such as the funky black counter stools and light fixtures. To balance the look, Rosen added a black frame around the range area, echoed in a black detail on the island, which contains the sink and a dishwasher. For the perfect backdrop, a porcelain slab emulating white marble with striking charcoal-grey veining was used on the backsplash. Counter space is maximized by the peninsula that also serves as both a visual divider and a sideboard area. A spacious walk-in pantry that is off the kitchen compensates for the lack of overhead cabinets. 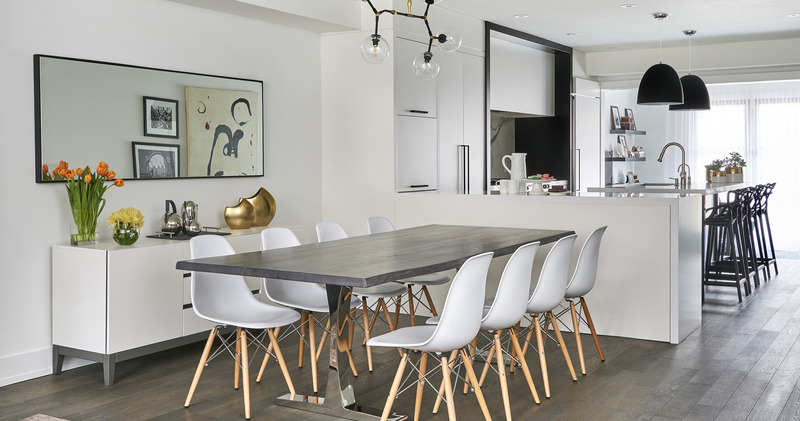 “The kitchen is the heart of the home, literally,” says the designer. “It lies at the central point between the front and back of the house, the more public and private sides.” The living room runs off the dining area at the front of the house, while the family room faces the backyard. 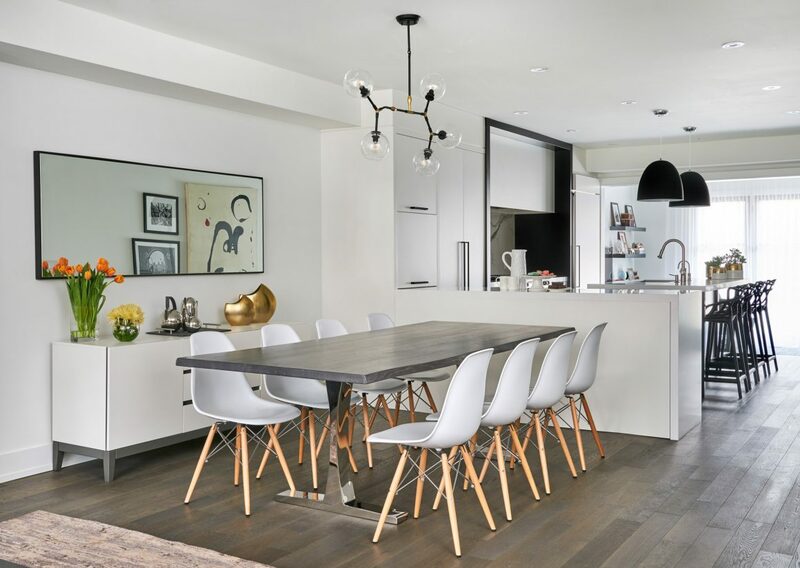 The kitchen’s clean lines and a black-and-white colour scheme set the tone for the rest of the home’s update. Counter stools: Kartell, Masters model; light fixture: Nuevo; appliances: KitchenAid and Dacor. 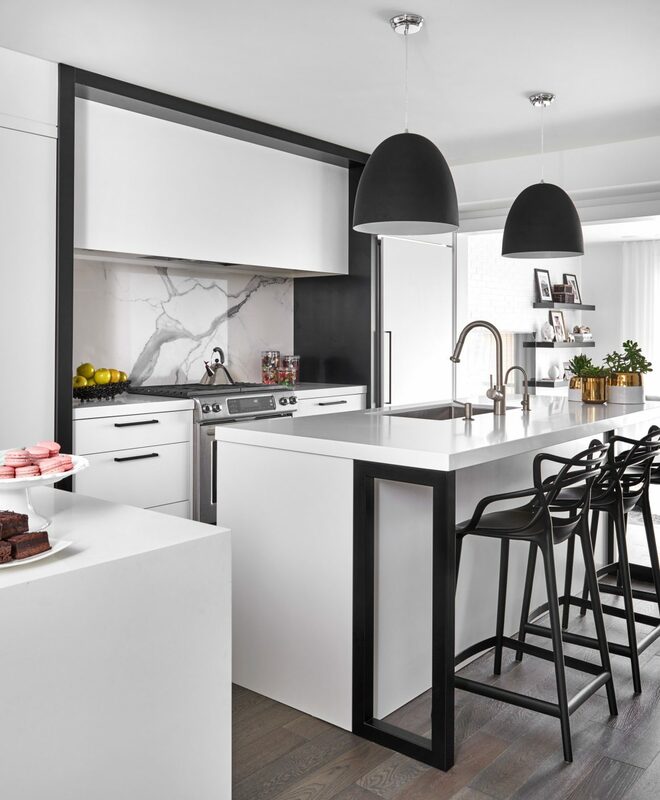 The kitchen’s black-and-white colour scheme set the new, more contemporary style. To ensure it carried throughout the entire home, all doors on the main floor are black, walls are painted white. The living room’s existing gas fireplace received a very dramatic makeover. Rosen framed it in black Caesarstone and then covered the face with MDF panels painted a shade of slate with contrasting lines in between painted black. 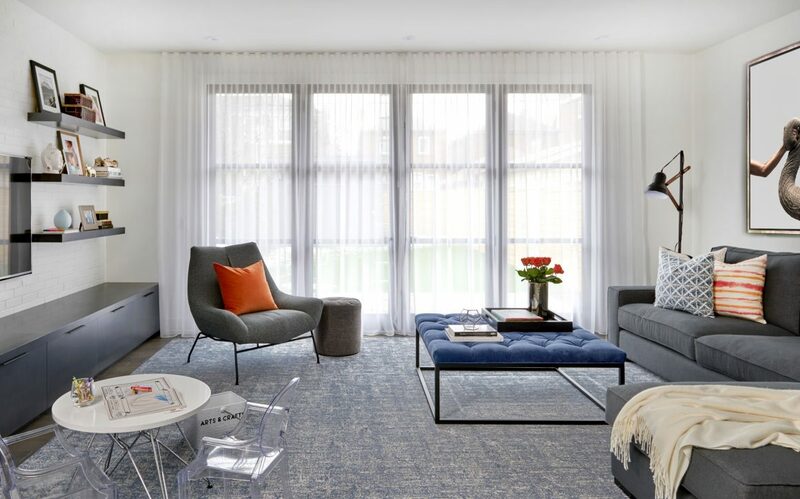 Shots of bright, cheerful colour accents add a sense of fun to all the sophistication. They appear in accessories throughout the home, especially in the children’s rooms. 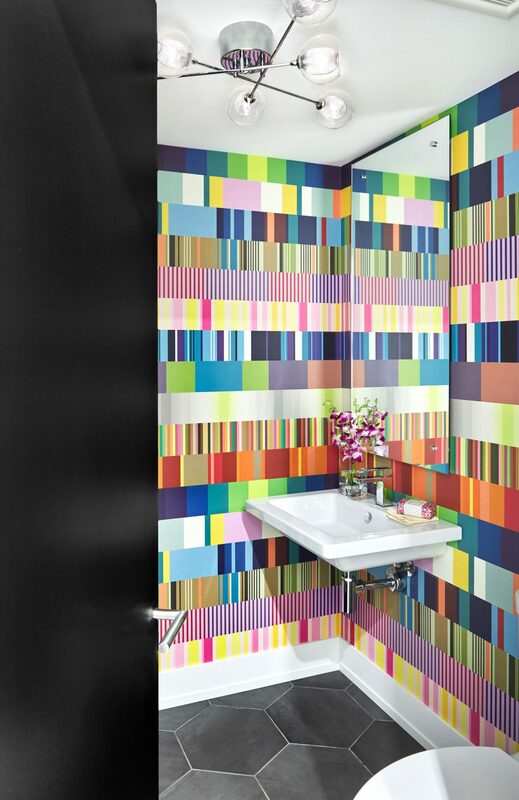 Wallpaper provides the wow in the powder room. Porcelain floor tiles in aaa plain wall-hung sink reference the home’s 1930s origins. Wallpaper: JF Fabrics. Colour takes centre stage for the main floor powder room. Rosen calls the multi-hued wallpaper pattern “dizzying, but a lot of fun;” she and the homeowner liked that it pulled in all the colours used in the home. 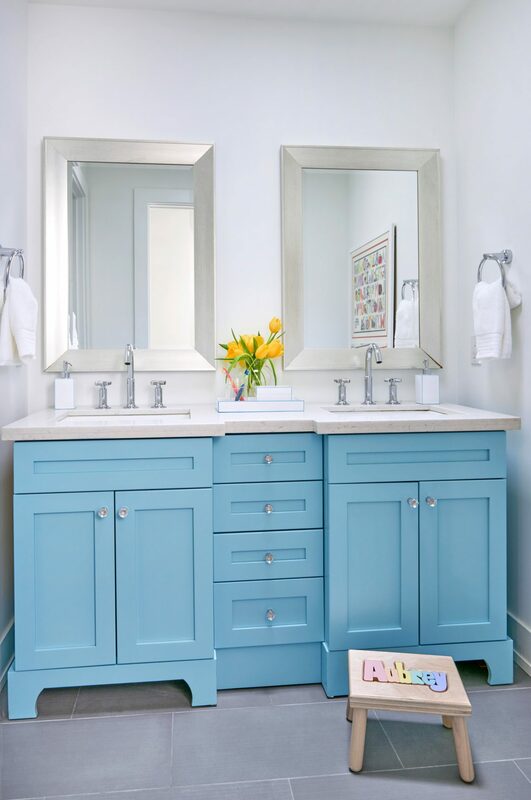 Upstairs, a vanity original to the home was given a coat of bright turquoise paint and moved from the master bathroom to the one shared by the children. 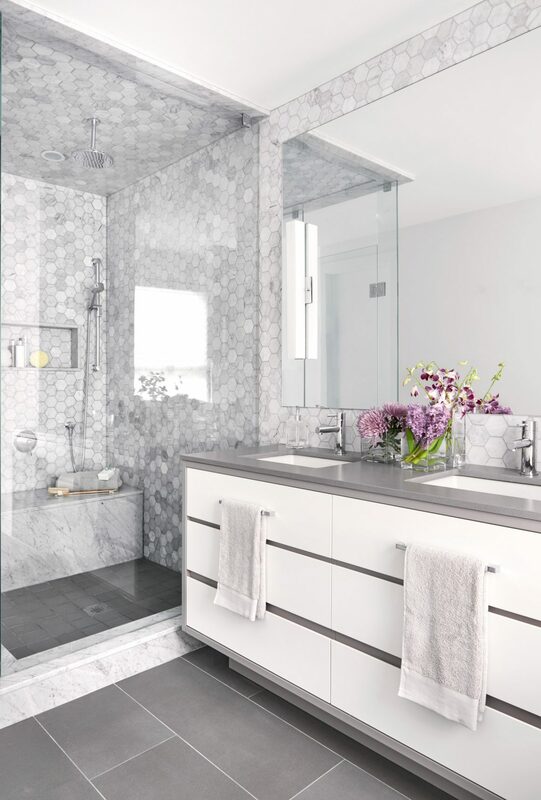 In contrast, the master bath remains a serene oasis in shades of white and gray. Designer Jodie Rosen repurposed the master bath vanity, original to the home. Now in the second-floor bathroom and shared by two girls and a boy, it was painted a cheerful, gender-neutral turquoise. A serene retreat was created in the master bathroom using a mix of hexagonal Carrara marble tiles and large porcelain planks on the floor. With no space for a towel bar on the walls, they were affixed to the hidden-pull cabinets. Standalone tub: Mirolin. Since the family mainly used a side entrance, it wasn’t much of a sacrifice. To make up for it, space that would have gone into the kitchen was used to create a utility area. Along the corridor are found the pantry, powder room, and a mudroom to which the designer added more cabinets and benches to store coats, boots, strollers and sports paraphernalia.